This newly constructed traditional home located just across the street from Mill Creek Marina and Noyack Bay s in the works from Farrell Building Company. 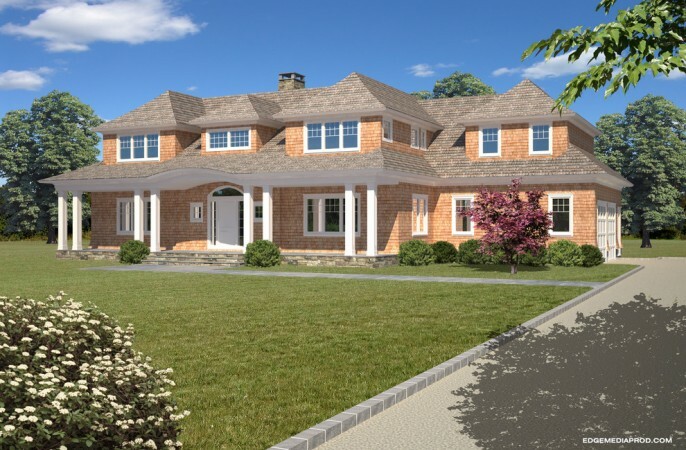 With all the amenities and finishings you've come to expect from the Hamptons most innovative builder, this 4,400 SF residence offers a great room with fireplace, living room with fireplace, formal dining room and a gourmet kitchen. Powder room, mudroom with custom cubbies, laundry and a 2-car radiant heated garage complete the first floor. Upstairs the master suite with fireplace and private terrace rules over 4 additional bedrooms with baths all ensuite, all serviced by another laundry room. An additional 2,000 SF of living space can be found in the lower level with recreational areas and abundant space. Outside you'll find a heated Gunite pool with spa framed by stone patios and lush lawn and landscaping. Preview today in order to be able to experience this beautifully built new home for Summer 2014. Drive past the ocean-facing towns of Southampton, Water Mill, and Bridgehampton and you'll find the beauty of the bay "north of the highway": Sag Harbor. Main Street is a picture-perfect vision of what an ideal town should be: leisurely, family friendly, featuring unique boutiques, and top restaurants. Add to that the cultural caché of the Bay Street Theatre with the celebrity cache; American Hotel and you have a formula for the good life. Sag Harbor's pedigree as a major whaling port during the 1800s is evident in its architecture, which has been meticulously preserved by its house-proud owners of today. Walk down Sag Harbor's streets and you'll see grand Greek Revival mansions, old Victorians with all the gingerbread, charming cape cottages, and authentic saltboxes. Warm weather mariners have an embarrassingly rich array of marinas, yacht clubs, and docks to choose from. Sag Harbor's shores, with the vista of Shelter Island in the background, provide sand and pebble beaches with gentle waters. Those who hear the siren's call know that home is where their heart is: Sag Harbor.